Seasonal Occurrence: Relatively common fall through spring. Profile by Glenn Olsen: Sharp-shinned Hawks overwinter in our area but the best time to see this smallest member of the accipiter group is during migration. 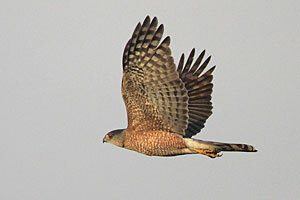 Accipiters are specialized hawks with short rounded wings and long tails. These fast and agile raptors are adapted to live and breed in heavily wooded forests where their main prey is smaller birds. The Sharp-shinned gets its name from the fact that the "shin" area of the lower legs is thin and sharp instead of rounded. This is noticeable with a bird in hand. 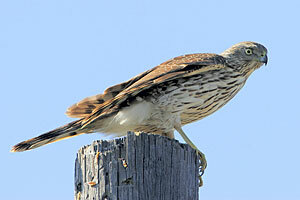 The Cooper's Hawk and the Sharp-shinned Hawk are the only regularly occurring accipiters in our area. This species breeds primarily in the boreal forests of Canada and in heavily wooded temperate forests of the northern United States. During migration they can be found in open areas bordered by trees, along riparian areas, and overhead. During our winter months your backyard bird feeder may be a favorite haunt where it may take a dove, sparrow, or other bird for dinner. That is part of nature and please do no begrudge the bird for being itself. Males are smaller—sometime substantially so—than females; a characteristic known as reverse sexual size dimorphism which is common in the hawk family. This attribute can make it challenging to separate a large female Sharp-shinned from a small male Cooper's. A male Sharp-shinned is typically about the size of a Blue Jay and a female Sharp-shinned is generally the size of a pigeon but lacks the broad breast look of a pigeon. Cooper's are larger—almost as big as an American Crow. Plumages of both species are very similar. Adult birds have a blue-gray color plumage on the upper parts and a pale orange-ish barring across the breast. Immature birds have brownish backs with off white breasts and brownish streaks. Differences in structure are the best way to tell the two species apart. The Sharp-shinned has a smaller, more rounded head than the Cooper's. Its tail is less rounded than the Cooper's and may have a small notch in the center of the tail. The Cooper's tail usually lacks a notch. Note that the appearance of the tail is not always as obvious as the words make it seem. Last but not least, the Cooper's has a more pronounced white terminal band on the tail whereas the Sharp-shinned has a thin, narrow off-white to beige tipped tail. In flight, the Sharp-shinned appears to have a short, tucked-in neck and head, with the wrists of the wings about in line with the head. In contrast, the Cooper's head is large and extends out from the wrist line of the wing. The wingbeat also gives clues. The Sharp-shinned has a snappy, crisp, rapid wingbeat that, while technically not correct, appears to be a "fluttering of the wings" then the bird goes into a glide. The Cooper's also has a rapid wingbeat, but since the bird is heavier and more powerful, the wing stroke appears to be of the entire wing, from the shoulder out (no fluttering look) and then the bird goes into a glide. Fall migration is the best time to see Sharp-shinned Hawks. They begin arriving around mid-September but generally there are greater numbers seen at Smith Point Hawk Watch during the last week of September and the first week of October.